In this increasingly connected world, there seems to be a diminishing amount of purely personal experiences to savor. One of the last bastions of experiences that a man can truly call his own is the ritual of the shave. Some men may see shaving as an annoying daily task. I would say that, if treated properly, shaving can hearken us back to our more primal forebears who ritualistically shaved before going into battle. Failing that, shaving can be an excellent way for man to cosset himself much like a woman may go to a manicurist in order to pamper herself. However one chooses to approach shaving, there's a certain level of awesomeness that cannot be achieved using disposable cartridges. Chisel Shave Club aims to bring back the ritual of the wet shave by helping you find your best shave. What Chisel Shave Club offers is a monthly subscription plan dedicated to those of us who want to enjoy the ritual of an awesome shave. Chisel Shave Club has scoured the internet for the best wet shaving products and, each month, you'll get a box full of different products that have been put together to maximize your enjoyment of the wet shave. It all sounds pretty great in theory. But how does Chisel Shave Club actually hold up? 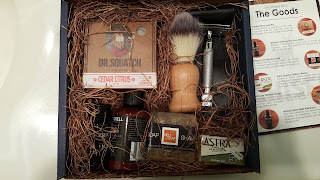 I got my box for this review about two weeks ago, and, first off, I need to say that Chisel Shave Club has knocked it out of the park with their presentation. The box is simply beautiful to look at. The contents included some facial cleanser, shaving soaps (one for shaving in the shower, one for in front of the mirror), after shave, a soap brush, a safety razor and two packs of blades. Chisel Shave Club has provided everything a man needs in order to get the most out of his wet shaving ritual. There's even a set of instructions on how to best use the products just in case you're totally new to the art of wet shaving. Normally, if I shave with a disposable blade cartridge in the morning, I've got a five o'clock shadow by about 3pm. I first used the contents of my Chisel Shave Club box on about 36 hours worth of stubble. I followed the instructions provided in the box and came out with a very close shave. Better yet, my five o'clock shadow ended up being two days late. As comfortable as the shave was, I wanted to see how the Chisel Shave Club system would fare on something a bit tougher. I let my beard grow out for a few days and then tackled it again. without changing the blade in the safety razor. My thicker hair proved to be no match for the blade and I ended up with yet another close shave with nary a tug or nick. Is Chisel Shave Club for you? Well, wet shaving isn't for everyone. It takes some deliberate time and care, If you do want to take the plunge, you'll be rewarded with a closer shave with less irritation. The Chisel Shave Club monthly plan is very affordable and, there's no commitment, so you can cancel at any time. Or, if you find that you're really enjoying the Chisel Shave Club experience, you can pre-pay for a few months and get a discount. Also, you can use my coupon code for Chisel Shave Club and get 10% off your first order. Just enter TOMMYM10 in the coupon code space upon checking out.